God made everything. We can clearly see his invisible qualities, his eternal power, and divine nature, through them, Romans 1:20 states. One of God's qualities or attributes is he is creative. We are made in his image so you and I are creative. We each express our creativity in different ways. And through the creations I've worked on, I hope to bring an encouraging word. 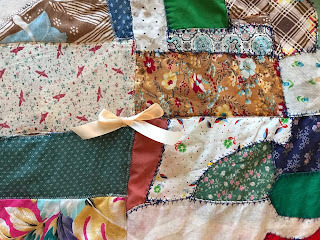 God has lessons for us in simple things, like our grandmother's quilt, which is the first blog I bring to you. Spring is a time for flowers, sandals, and fresh new beginnings. After a long cold and snowy winter I think most of us are ready for spring and sunshine. Yesterday, as I was getting ready for work, I heard a chorus of birds singing. It was such a joyful sound. It brought a smile to my face knowing spring and summer were on their way. Why not take a new step toward creating developing or achieving something you’ve been wanting to do? 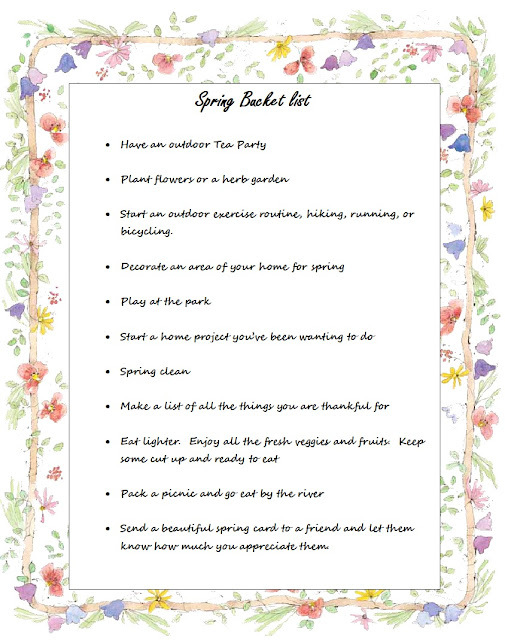 Here is a spring bucket list that I’ve made. Mid-morning, my husband would "get hungry" and call and ask me to bring him a treat at his office. He began calling more and more often. I let him know this couldn't happen every day! And so this is how Tasty Treat Thursday become a tradition. 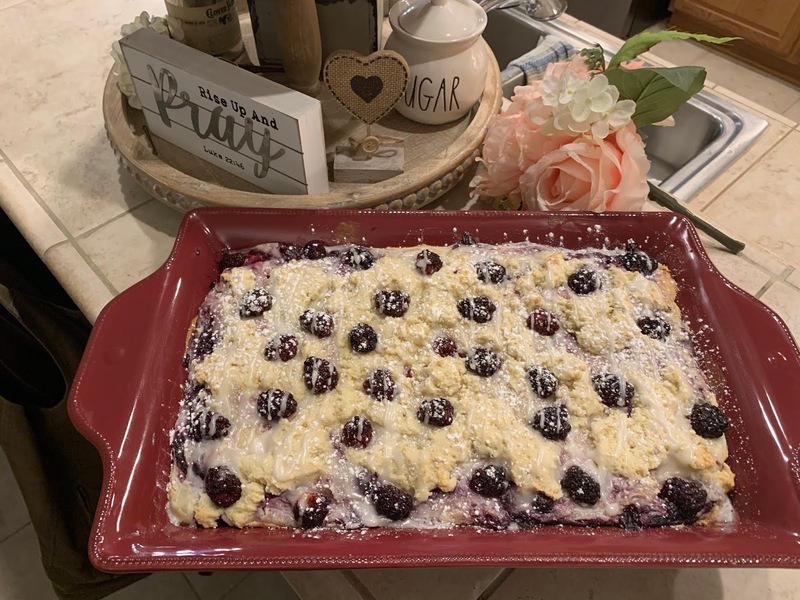 I guess you could say my husband's love language is food, which I believe would fall into the category of the love language of Gifts, in Gary Chapman's book, Five Love Languages. Baking a treat is one small way I can show my husband, I Love Him We've all heard the saying "Faults are thick where LOVE is thin!" And Peter said it this way in 1 Peter 4:8...Most of all, love each other as if your life depended on it. Love makes up for practically anything. Happy Tasty Treat Thursday! Treat Someone today! Throw it out or patch it? For our wedding, my grandma Bridgewater gave us a crazy quilt. Which means it is 25 years old now. It’s been through a lot with kids and house moves and after being washed many times, it really began to come apart. I considered whether to patch it or get rid of it. But as I stopped to remember who made it, why she made it, and all the hours she had spent making it, I couldn’t let it go. 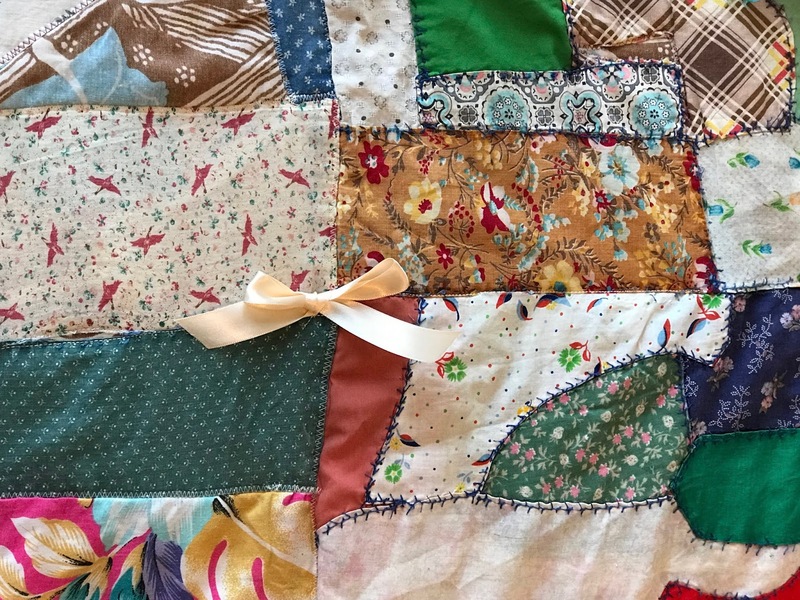 My mother had given my grandmother scraps of our dresses, shirts, and shorts to be made into this quilt. As I looked at each fabric piece, childhood outfits flashed in my mind. What fun to see fabrics from my childhood clothing. This crazy quilt was made by hand stitching. Grandma took a 12 by 12-inch block and put pieces, cut all different sizes and shapes, and overlapped them. She then hand stitched them together on the outside with a feather stitch. https://youtu.be/r_g_x1odOF8. As I began to pin the pieces back on the quilt where they went. Some couldn’t be stretched to fit back in the space. But I did the best I could. The fact was it didn’t look like it did the day my grandmother gave it to us. So, I got out some ribbon and lace and began to embellish the blocks and edging of the quilt. It was looking nice or at least It was beautiful to me. We as women love beautiful things. Pinterest is so popular because it gives us ideas to make stunning decorations, outfits, holiday crafts, meals and more. Along with those Pinterest passions we as women also like to feel successful in other areas of life whether it’s being a wife, mother, or employee. Too many responsibilities or challenges coming at us at once can make us feel weighted down or overwhelmed. The fact is there are days in life when we are going to have many things we must balance. So how do we keep from feeling overwhelmed? Dr. Caroline leaf explains in her book, Think, Learn, and Succeed, how stress can actually be good for us. “When we learn how to harness the power of our thinking, we can deal with and overcome whatever life throws our way. If we face a difficult situation with a “glass half full” attitude, the blood flow results in increased oxygen flowing to your brain. But if we see the glass half empty, we worry about stress and put our bodies into toxic stress." We can see hard things as problems or challenges. If it’s a challenge, we can win! We can fail at something but use it as a learning opportunity to grow, do better, and succeed. Paul said in Philippians 3: 13 & 14 he must forget what is behind him and look forward to what lies ahead. God knew how important it was for us to take every thought captive to the obedience of Christ, 2 Corinthians 10:5 , and fix our thoughts on what is true, honorable, right, pure, lovely, admirable, excellent and worthy of praise- Philippians 4:8. Thinking about all the things that we don’t like is toxic and doesn’t fix them. We must pray about those things, and let God do the work of changing them. God told the Israelites over and over again to remember how God brought them through the Red Sea and all the many things he had done for them. Being thankful puts us in a healthy mindset. We all at times, need to be reminded. I would like to think I try and think on good things but after so many months of looking for a house in Carson City, I needed to be reminded, God had a plan. My grandma’s kind act of service making this quilt was made by a lady who didn’t have life easy. She chose to love and serve her family despite what was happening in her own life. She chose to give the world the best she had! And as I wrap up in this warm quilt, I can feel her love. I must choose my thoughts today which will impact my actions tomorrow. Hey! My name is Melanie Reyman. I am doing a blog because I love decorating, refinishing furniture, and just changing up the house with the help of my handy husband. Creating style of any kind is energizing! I'm a mother of three, minister's wife and most importantly a follower of Christ. I love to spend time with God in the mornings with my dark roast coffee and get his help planning my day. Discussing a good helpful book with my sisters in Christ is meaningful and I understand how important it is focus on things that draw us closer to God. We can see God in all that we create. So I bring a few encouraging words with creations!